A scholar taste Chinese Jade ink stone. 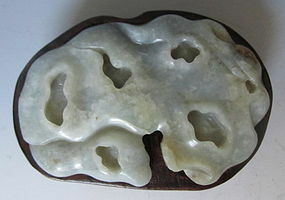 The stone is a nephrite jade in the form of a flat craggily gonshi stone. The use of the stone, which has inclusions would be used to hold colored ink or water. The reverse side is to grind ink stick. Often scholar objects reflect details from nature and would incorporate them in their study. Size: Length 4" Width 2.75" Height 1.3"